Here's the rules description for Comparative Tests. Where one stat is compared to another to find out what the required roll for success is. One of the backbones of M42 is it’s Comparative Test system. Where one Model/Unit’s characteristic stat is compared to another. The result of this comparison, on the chart to the right, is the number that you need to roll for the test to succeed. When you’re making a comparative test, you compare the stat of the model you’re rolling for on the chart, versus the stat of the model that it’s either affecting, or being affected by. The result is what you need to roll on a D6 for the test to succeed. One of the most common, if not the most common, comparative tests that you’ll have to make in M42 is that of a model’s Ballistic Skill (BS), versus it’s target’s Evasion (Ev). The result of this test will determine whether or not you hit the target with your model’s weapons. So it’s pretty important! As an example, let’s say that a human infantryman of BS 3, is firing it’s rifle at an enemy infantryman with Ev 3. What does he need to roll to hit? To find out, you would find the firing model’s BS on the left side of the comparison chart, and follow it’s row over to where it crosses the column for the target’s Ev. Since both stats are ‘3’, you follow the row for 3 over to where it crosses the column for 3. At the point where they cross you’ll see a ‘4+’. That’s what you will need to roll in order to hit the target. During a game of M42, you’ll rarely get a perfect unobstructed shot at an enemy model. So usually you will have to add one or more modifiers to the basic roll in order to determine what your final roll will be. With To-Hit rolls, your target’s Ev may be modified by range, concealment, or other factors, which are described fully in the Shooting section of the rules. The easiest way to take these modifiers into account is to find the base skill vs. skill roll, and then add in the modifiers afterwards. In the case of a target getting a combined +2 Evasion for being both concealed and at long range, you would first find the basic required roll. For BS3 vs. Ev3, this is a 4+. Place your finger there. Then you would move your finger 2 places to the right to represent the +2 Ev bonus. Your finger would then fall on the ‘6+’. Which is what you will now need to hit the target. For easier comparisons, all M42 modifiers for comparative tests are applied to the second characteristic of the test. So you’ll never have to move your finger up or down. Only side to side, and usually to the right. This is another common comparison. Which is made to determine whether one model has hit another with it’s melee weapon. To do so, follow the row for the attacking model’s Weapon Skill (WS), and compare it to the defending model’s WS. The result is what you will need to roll in order to hit the target. If a model has been hit, either with a ranged weapon or in melee, then that model will usually get to roll an Armor Save. 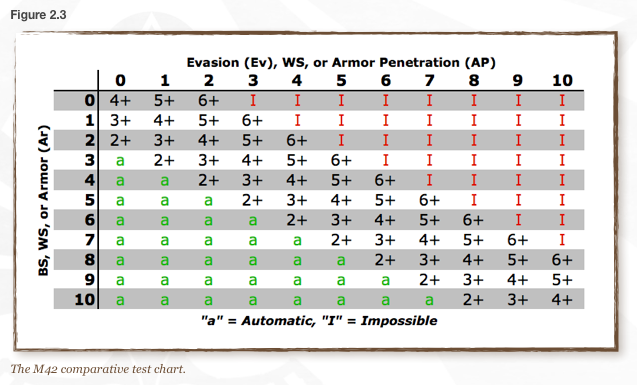 For this test, compare the model’s Armor (Ar) characteristic with the Armor Penetration (AP) of the weapon used. The result is the roll needed in order to deflect the shot/blow before it does damage to the model’s squishy innards. On the comparison chart, you will notice that some comparisons result in an ‘a’ (or ‘automatic’) result. If this is the case, you don’t need to roll at all. Your test will automatically succeed! You will notice that some comparisons result in an ‘I’ (or ‘Impossible’) result. This means that the test cannot normally succeed. The targeted model is simply too hard to hit, or the defending model’s armor has no hope of deflecting the incoming shot. All hope is not lost, however. For Lady Luck may yet save you, as she often does in war. Roll the dice anyway. If you roll any 6’s, pick them up and roll those dice again. If you roll another 6, then you’ve gotten lucky and succeeded against all odds! All comments are welcome and encouraged. We want to hear from everyone!